Just because technology has changed drastically doesn’t say that you should abandon the old- fashioned way techniques. Nowadays, it seems that more and more people are getting tired of dealing with computers. Isn’t it time to give typewriters a second thought as against the use of computers? These supplies are worth trying out. Like many others who use computers a lot, there are times you would open up your laptop, and you instantly receive a prompt to update your computer or download the latest software, install some sorts of web browsers as well as anti-virus software. Interestingly, this would sometimes get you pissed off, and you feel like throwing your computers against the wall. Fortunately, this annoyance can be maneuvered whenever you use a typewriter. Unlike computers, you needn’t wake up to this friendly reminder that it’s been 150 plus days since you ran the last update on your laptop popping up towards the right corner of your computer’s screen. Yes, it’s enough reason to write with a manual typewriter. Historically, over 30,000 websites are being susceptible to hacking on a daily basis. Furthermore, several researches also reveal that over 47% of adults have battled with cases where their computers are hacked. This implies that your works and files won’t be saved unless they are really handwritten on a typewriter. Remember, your email doesn’t have all sensitive information. Obviously, there are times you’ll create documents that contain personal information, financial information, password lists and so forth on your desktop. Whenever you use a manual typewriter to write, it’s an excellent alternative to protect your sensitive information without having to write it out long-hand. With a typewriter, it’s a safer way to protect your files in your drawer with a key, without creating a password that can be guessed by your friends and families within a twinkle of an eye. Nowadays, numerous people are getting more concerned about cybersecurity. With the use of a typewriter to write, you’ll be at ease sleeping while knowing truly that your personal details are safe and secure. Everyone will always have a story to tell. Yes, all these stories would always end the same way. Fortunately, there are no issues as these whenever you use a typewriter. Yes, it is even possible to create the carbon copies of your files when it comes to having an extra backup. To be honest with oneself, you wouldn’t remember the last time you have backed up your desktop files. It’s high time you try using a typewriter. Plus, keeping a good track of your files will significantly help in making you a great leader. This isn’t only about the bucks of dollars you can save on the initial lists. When it comes to comparing the repair costs, time as well as productivity, you would be at the looser ends while waiting on the costs of upgrades, power cords, repairs, and even new machines. Yeah, you understand that. Manual typewriters are far more affordable than the digital counterparts. All that is required is to get a few other things regularly. Typewriters shouldn’t be regarded as a great avenue to avoid modern technology. Undeniably, typewriters are pretty smart investments. A whole lot of people are getting to the brinks of collecting typewriters. Surprisingly, the wide acceptance of typewriter is rapidly becoming a lucrative industry. 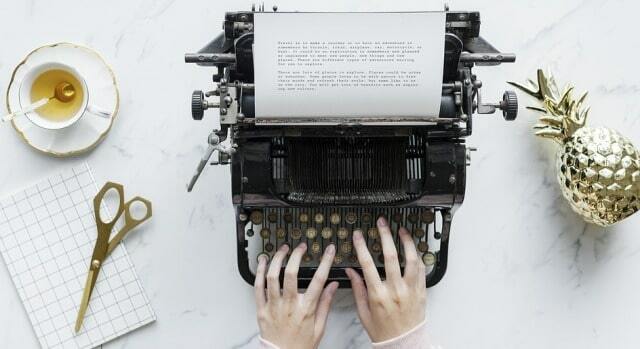 Whenever you are ready to move into different models, or you are migrating from one geographical location to another, and you can’t take your typewriters along with you, do not be surprised if your typewriter sells far more than you paid for initially. Some online platforms list manual typewriters for sale for over $1000. Yes, that’s hardly a spare change. To many readers, this may sound somehow silly. However, there is an absolute inadequacy in access to consistent electricity in some parts of the world. This is a major cankerworm that affects both profits and workflow. For instance, Indians rely heavily on computers, and typewriters have remained a real lifesaver whenever the is electricity on the fritz. If your company is at the brinks of breaking down due to inadequacy in electricity supplies, you won’t find anyone laughing. Thankfully, manual typewriters are available. You won’t have to work assiduously over the weekend. Even if you aren’t always on tight schedules, there are times you’ll feel the urge to rush through some works from time to time. However, since manual typewriters aren’t designed with a backspace, you’ll be forced to be more deliberate with your choices of words. Apart from that, you’ll also need to take your time and avoid careless errors. Interestingly, you’ll find yourself improving in the quality of your works. Indeed, typewriters are great ways to self-edit your words as you go along the typing. Ultimately, you’ll save more time. And yes, you’ll significantly improve your spellings too. Obviously, the fact cannot be denied that using a manual typewriter to write isn’t just more than typing on a keyboard. The sounds of keys are just more than satisfying. It’s extremely hard not to feel insanely productive whenever you are hammering away especially if you are creative. When it comes to writing with a manual typewriter, there’s a good reason for it. You aren’t following the trend blindly. There you have it! Perhaps 8 Classic Reasons to Write with a Manual Typewriter. There isn’t any need for you to live in Brooklyn and walk around with a handlebar mustache to enjoy the benefits of manual typewriters. All you need do is to care more about your writing work, protect it and enjoy what you’re doing.